This was Lewis’ last book, a printing of his lectures on Medieval and Renaissance Literature. 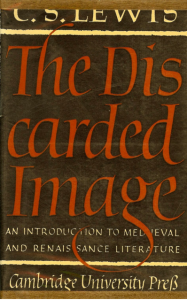 It is a fascinating account (the “Discarded Image”) of the Medieval world view of theology and belief. Their view of the world was “a single, complex, harmonious mental model of the universe.” From the Unmoved Mover, to the Four Temperments to the KJV’s use of “devils”, to guardian angels, and many more, Lewis leads you through a maze of early references and beliefs in such things. I enjoyed the chapter on the Longaevi, that is, fairies, elves, nymphs and the like. Well, I did!